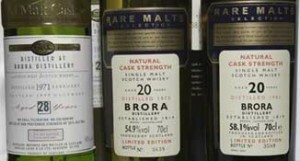 It almost seems certain now that Brora whisky will soon no longer be in production, but there are still bottlings available. What is beyond doubt is that this will be a whisky aficionados will still be talking about decades after the last bottle is finally drunk. This means that it might be a good idea to stock up for investments sake on top of the fact that the Brora distillery has an excellent selection of bottlings for the tasting.